Gables, twin dormers, an elegant arched window, and a cozy front porch strike the perfect balance on the facade of this stylish, yet affordable, bungalow. This charming appearance alludes to its comfortable interior. 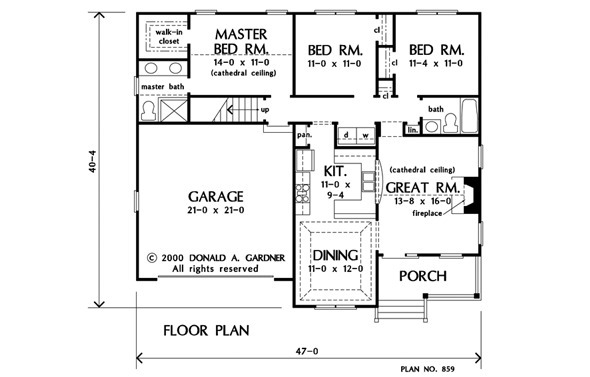 Easy traffic patterns make all the rooms in this modest home convenient to one another. Cathedral ceilings create spaciousness in the great room and master bedroom, while a tray ceiling adds a formal touch to the sole dining area. The kitchen stays connected to the great room by way of a pass-thru with a raised and curved counter. 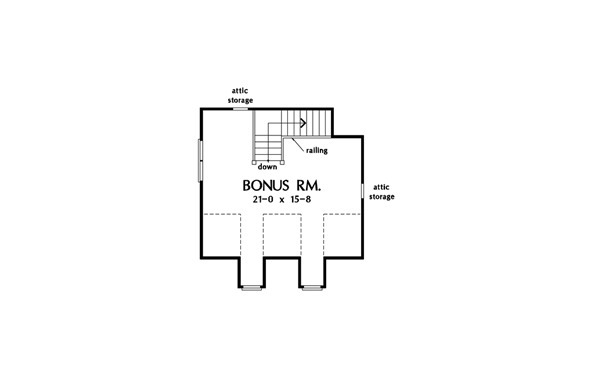 An expansive bonus room is located over the garage, offering storage solutions and expansion opportunities. 1st Floor: 1228 Sq. 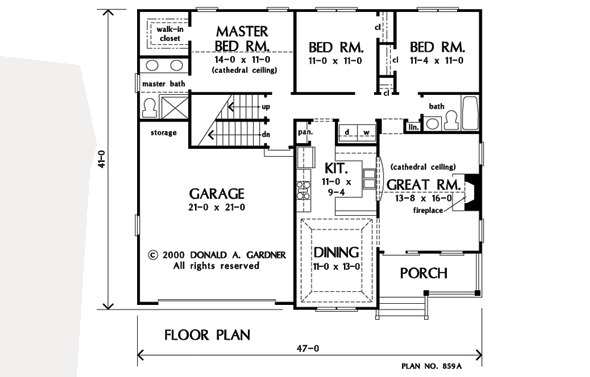 Ft.
House Dimensions: 47' 0" x 40' 4"
Great Room: 13' 8" x 16' 0"
Master Bedroom: 14' 0" x 11' 0"
Great Room (Cathedral): 13' 8" x 16' 0" x 15' 10"
Kitchen : 11' 0" x 9' 4" x 9' 0"
Utility Room : 5' 4" x 3' 0" x 9' 0"
Bonus Room (Vaulted): 21' 0" x 15' 8" x 9' 0"
Master Bedroom (Cathedral): 14' 0" x 11' 0" x 13' 6"
Porch - Front : 14' 0" x 6' 0" x 0' 0"